Spitalfields is an area rich in urban heritage located in a prime development zone immediately adjacent to the City of London. Spitalfields also has a very strong sense of local community with residents enjoying all the amenities normally found in a town much larger than our permanent population could normally sustain. 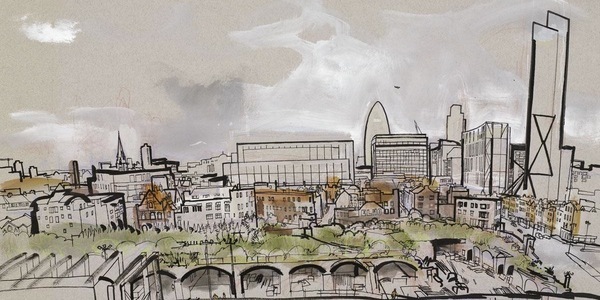 Spitalfields is a cherished urban treasure under great pressure and facing many challenges. The name “Spitalfields” is derived from two words; Hospital and Fields; and relates to an 11th Century priory hospital called in full, The New Hospital of St. Mary without Bishopsgate. The hospital was established by Walter Brune in 1197 and it existed until the dissolution of 1540 when it fell into ruin and eventually disappeared leaving only its name. Most of the streets you see today were laid out during the mid 17th Century and owe their place and condition to people of vision such as William Wheler, after whom Wheler Street is so named but dozens of streets around Brick Lane also owe their origins to him; and Thomas Brushfield (see Brushfield Street) who was responsible for a long period of excellent local governance and many local works in the 19th Century which raised the area’s profile and improved the lives of its poorest inhabitants. Then there is John Balch to whom we owe the existence of Spitalfields Market by obtaining letters patent from Charles II in 1682 and his notable successor Robert Horner who oversaw the market’s expansion and is responsible for the present buildings you see today. Finally, there is Nicholas Hawkesmoor who was neither a resident nor worked here but must be thanked for gifting Spitalfields with his finest work; the architectural gemstone which is Christ Church. People today are proud to say they live in Spitalfields and this strong local character and identity has deep roots in the enduring civic identity which began with the founding of the priory hospital in 1197 and reach well beyond dissolution right up to the present day. There are surviving records of town meetings going back to the 17th Century and a separate parish of Spitalfields was established in 1729. Self government was fleeting though, because most of the responsibilities the parish vestry had were taken over by the Whitechapel Board of Works in 1855 which was itself superseded by the Metropolitan Borough of Stepney in 1901 and the London Borough of Tower Hamlets in 1964. As local government fluctuated so did the quality of life enjoyed by the people of Spitalfields. The fine Georgian houses many people come to see that are found in Norton Folgate and in the streets nighest the church hark back to a time when parts of Spitalfields were quite industrious and well-to-do. The population of skilled Huguenot refugees who gathered here in the late 17th Century developed silk-weaving and can be thanked for most of the surviving buildings of note. As the Huguenots gradually became indistinguishable from the surrounding London stock they also moved out and were replaced by subsequent influxes of impoverished Jews and Irish. By the advent of the Victorian Era the area had declined into the capital’s most notorious rookery and the fine houses now found themselves the densely occupied homes of a population described by contemporaneous writers as squalid, destitute and debauched. The population weathered Hitler’s bombs and after the War, as we entered the New Elizabethan Era, change came once again as artisans and further waves of settlers began conserving, improving and reinvigorating this precious place until it became the celebrated neighbourhood we know today. If you would like to get involved, learn more or even join us – please contact us here.